One of the hockey brands I like to review best is Mercian and one of their best sticks in the Pro-Line 001. Why I like Mercian is partly because their head office is local to where I live and I’m patriotic. The other is they keep the range simple and the hockey stick high quality. The Pro-Line 001 from Mercian takes this simplistic but quality review to a higher level. From its simple name, 001, to it’s high tech Piezo-Electric fibres, the Mercian Pro-Line 001 is an amazing piece of British understated engineering. I mention on the Merican hockey stick review homepage about the brands obsession with materials. The Pro-Line 001 has a huge 90% carbon fibre content supported with 5% fiberglass and 5% Kevlar. Notice I use the word Kevlar, the Pro-Line 001 from Mercian follows the brands ethos of using the very best material and Kevlar is a world-renowned brand of aramid. Surprisingly the Mercian Pro-Line 001 doesn’t include the basalt material that I find most interesting. Just the traditional composition of Carbon fibre, fiberglass & Kevlar, but it does make a super stiff hockey stick competing directly with the top of the range hockey sticks of the era. Alluded to above is the use of Piezo-Electric fibres in the Pro-Line series of sticks from Mercian. This scientific wonder material is added in to the resin mix that holds the hockey stick together and is designed to reduce vibrations up the shaft. I’m not convinced by anti-vibration technology, if you catch the ball correctly you rarely get any major vibrations, but at least Mercian go some way to talk about what they do specifically. For Mercian this technology is randomly abbreviated to VRZ in the Pro-Line range. Mercian hockey sticks have become famously light and the Pro-Line 001 is available in Medium and Light. From handling the Mercian Pro-line as part of my review the medium does feel slightly lighter than mediums from other brands, perhaps 10-20 grams (the guy in the shop wouldn’t have appreciated me getting out the weighing scales) so go for the medium if you are advancing your skills. Buyers beware comes in choosing a stick from the correct year. Mercian has been producing fantastic sticks for ages so you can’t go wrong. However I have noticed that there are a number of previous year models available online of the Pro-Line 001 and if you want the latest advancements with the VRZ, you need to make sure you buy the Pro-Line 001 with the gold head and not the stripes. Late or low bow seems to be standard for so many brands now and the Mercian Pro-Line 001 features their Late bow shaft. This bow is particularly low to the ground even though they don’t feel the need to call it “extreme”. At 200mm from the bottom of the head the curve of the Pro-Line 001 is as low as can be. While talking about the bow, it’s not only low but its bendy too. For the ultimate dragability the Pro-Line 001 is setup for the budding drag flickers, Ashley Jackson watch out! What I noticed about the late bow in the Mercian Pro-Line 001 is I found it very, very late and curved. If you are not used to this or do not need the extra power this gives dragging the ball you might not enjoy it. There are better options from Mercian for a player who wants a little straighter feel to their hockey stick. Built with amazing materials and designed in to a great specification the Mercian Pro-Line 001 is a great hockey stick. Design wise it is a thing of beauty. Black and gold signifies a true class style with the fantastic looking reverse of the hockey stick all in black it looks an absolute dream. I certainly enjoy the Mercian logo across the front of the stick that lets the opposition know what you are about. At the top end of anyone’s hockey stick budget you want a stick to last and this Pro-Line 001 has everything good about it to make that happen. 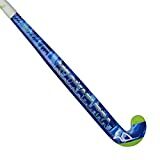 If you want to drag flick go for this 001, if you want to save a few pounds but still want an awesome Mercian stick, you might want to check out the review of Mercian Pro-Line 002 hockey stick as that is a great option.